The viola organista was dreamt up by Leonardo da Vinci but until recently it had never been built. Now, a Polish instrument-maker has painstakingly created the first ever example and it sounds remarkable. The instrument wasn’t built during Leonardo da Vinci’s lifetime, and it was only in 2013 that Polish instrument-maker Sławomir Zubrzycki built the first example. The unusual instrument is a hybrid of elements from a harpsichord, an organ and a viola da gamba. 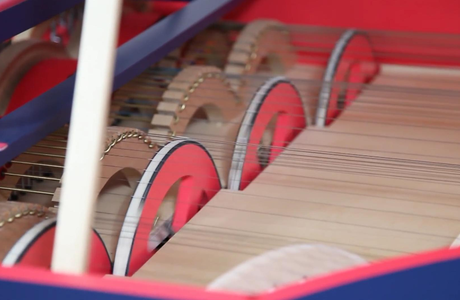 It looks like a harpsichord and has a set of strings, but rather than being plucked, the strings press against rotating wheels covered in horse hair – the same mechanism that produces sound in string instruments. “I have no idea what Leonardo da Vinci might think of the instrument I’ve made, but I’d hope he’d be pleased,” Zubrzycki said, at the instrument’s unveiling concert in Krakow. He spent three years and more than 5000 hours bringing Da Vinci’s instrument to life from his Codex Atlanticus, a 12-volume collection of his manuscripts and designs for everything from weaponry to flight.